As Europe’s largest economy struggles to find its future path, what about calls that Germany is Europe’s hegemon? As Germany’s main political parties struggle to find a formula for a new coalition agreement under Angela Merkel’s leadership, the rest of Europe is testing the waters.Some argue nothing in Europe can move forward with a Germany occupied with itself. Others relish German paralysis. Yet again others fear German dominance no matter what. That is quite a spectrum of opinion. Where should the future European journey go? The majority of Europe’s political elites are trying to determine the proper pathway. Should there be further integration towards a United States of Europe? Is such a move not mandated as a proper global counterweight in a world marked by the incessant rise of China, the hard-to- calculate Russians and the demise of the United States under Trump as the leader of the free world? France’s President Emmanuel Macron has definitely defined such a response as his main aim. He needs Germany to come on board, not least to guard against the centrifugal powers of populism that are rising throughout most of Europe and keen to destroy his dream. But where does Germany stand? Is it really tearing apart at the fringes? That’s the suggestion of many who see the German elections in the dark light, on account of the success of the extreme left and right parties. Sections of the British press compared the right-wing AfD‘s march into the Bundestag to events in 1930. Fortunately, this is far from the reality. Germany’s centrist parties scored an overwhelming 78% of the vote. Still, one cannot deny or underestimate the disruptive danger of populism. In Poland and Hungary, for example, populists are making hay out of old fears and tribal aspirations. One underlying thread that united much political analysis throughout Europe is the fomenting of fears that is associated with the talk of a new German hegemony. In my view, that is just alarmist talk, designed to whip up the forces of populism in whatever country whose leaders think in those terms. Others present a milder suggestion. For example, David Marsh in a recent article on The Globalist talks about a rerun of the Holy Roman Empire of German Nations in the Middle Ages. That, too, sounds ominous. However, any student of history knows that Germany‘s neighbors would have nothing to fear. That Empire was never dominated from the center. In fact, the center was kept deliberately weak. Power resided in the leaders of the constituent parts of that empire, who elected whoever the new emperor would become. It was thus anything but an effective political entity. If anything, that Holy Roman Empire – transferred to our era – actually resembles quite closely the European model which the UK always has in mind. If one wants to compare the European present with the past, the first German reunification in 1871 is a more fitting example. Driven by the onset of the industrial revolution (today’s equivalent of globalization in terms of its transformative powers), first a customs union was created. Then, under strong leadership by Prussia, came monetary and political union. But even that parallel doesn’t really fit for various reasons. Anybody looking for a clearer understanding of Germany’s multi-layered historic, social and cultural role in Europe should read Stephen Green‘s excellent book “Germany the Reluctant Meister.“ He hits the nail on the head. True, unlike the SPD – her potential governing partner – Merkel will only be a reluctant follower when it comes to German taxpayers shouldering too much of the cost of futher European integration. But I am sure Merkel believes it is a reasonable price to pay, all the more so as she can rely on the Social Democrats to provide her sufficient political cover. They will allow her to convince most of her voters, who want the CDU to govern, that this is worth the cost. Which leads to one big question in the European context: Will the SPD jump aboard the Merkel bandwagon once again? The reason why I feel confident about a rerun of the last coalition is that the Social Democrats need not to fear playing second fiddle to her and falling further back in the next election. This is definitely Merkel’s last term in power. In fact, it would be a surprise if she stayed the full term. Author Bob BischofPosted on December 15, 2017 Categories Articles, Europe, German BusinessLeave a comment on Merkel’s Germany: Shaper or Taker of a United Europe? If you plan to read Paul Lever’s book, Berlin Rules: Europe and the German Way, to enjoy a bit of good old fashioned German bashing, and to confirm your anxieties about a Europe run by Germany, you might be disappointed at times and reassured at others. In just over a decade, Germany has been transformed from the ‘sick man of Europe’ into a domineering and threatening force, according to some. Given the UK’s decision to leave the EU and the negotiations about the terms of Brexit, there is renewed interest in all things German, and British authors have responded. Read the review in full – download PDF. The German British Forum is delighted to announce that Lord Mandelson will join its supervisory board as President with immediate effect. The German British Forum is the United Kingdom’s primary bilateral forum for discussing German-British affairs and activities, particularly promoting dialogue on business, social and political issues. Peter Mandelson is a senior British Labour politician and chairman of strategic advisory firm Global Counsel. He is a former European Trade Commissioner and British First Secretary of State. As Trade Commissioner between 2004 and 2008, Peter negotiated trade agreements with many countries and led European negotiations in the WTO Doha World Trade Round. Lord Mandelson became President of the Great Britain China Centre in 2015, and he is also President of the Policy Network think tank and Senior Adviser to Lazard. With several strong links connecting Britain and Germany, the German British Forum welcomes Lord Mandelson’s experience of international affairs to the board. The GBF’s current president and co-founder David Marsh is stepping down to dedicate all his time to OMFIF, the Official Monetary and Financial Institutions Forum. For more information about the German British Forum please visit our website www.gbf.com or contact me. When the Germans are bad, they are b……y awful, but when they are trying to be good, they seem to be more annoying and irritating to some. Edward Lucas must be congratulated on his thoughtful article today (“Self-righteous Germany has left guilt behind”) – in spite of its misleading headline. When the Germans are bad, they are b……y awful, but when they are trying to be good, they seem to be more annoying and irritating to some. These are of course two sides of the same coin. As a German, who has lived and worked in Britain for over 40 years, I am beginning to be proud to be German again. The latter side of the coin suits me and my countrymen definitely better. Long may it last. As for Britain leaving the EU and inevitably hitching closer up to the US, I hope the famous British common sense will prevail. The German government is running a scheme to tempt ‘A’ level qualified people aged 18 to 35 to Germany to serve an apprenticeship during a three year period all expenses paid – a new “Auf Wiedersehen Pet” story. British companies needing to recruit talented young people have some competition now: the government of the Federal Republic of Germany is paying to recruit young people from Britain to receive full training in up to 300 occupations. The International Business Academy (IBA) in London, which was appointed to administer the scheme in the UK, aims to provide hundreds of young people from UK to Germany for apprenticeship placements and work in specific areas. The scheme is recruiting people aged 18 to 35 years for both vocational training and jobs for young professionals in fields like engineering and healthcare. The latter requires ready-trained professionals. The recruitment drive is evidence that Germany is planning for the fall in its domestic workforce in 10-20 years time when low birth rates will be felt. To be eligible for vocational training courses, candidates must have ‘A’ levels or a Baccalaureate but a degree is not required. Knowledge of some basic German is needed in particular for apprentices, who need to go to college once a week under the dual training system. Successful candidates receive a full package of benefits designed to tempt people to relocate to Germany, including 170-hours of German language lessons in England or Germany before the final placement in a German company, a minimum net salary of Euro 818 per month during training, which lasts approximately three years. Travel costs for the interview in Germany are covered, as are relocation costs to Germany if the person takes the placement or job and two free flights home every year. The German government has capped funding for the programme to Eu139 million. “There is no allocation to the individual nations, it is a first come, first served basis,” says Wulf Schroeter who runs the IBA in London. Germany has a shortage of occupations for which there are numerous job opportunities, especially for technicians and engineers, hotel and catering jobs and doctors and healthcare professionals. “For these occupations, trained specialists are needed. In these and in more than 300 other professions, apprenticeships can be offered,” says Mr Schroeter. IBA is part of the FuU Group, a training institute based in Heidelberg appointed to run the UK scheme within an EU-wide framework called Mobi-Pro EU that promotes young and unemployed professionals within Europe. “Only organisations that are recognised by the German Federal Ministry of Social Affairs may place young professionals in to German companies,” Mr Schroeter adds. A new German word has entered the English language after ‘Rucksack’, ‘Kindergarten’ and the phrase ‘Vorsprung durch Technik’, namely Mittelstand. It means different, yet related things – it describes a medium-sized company, but it also means doing business in a very German way. 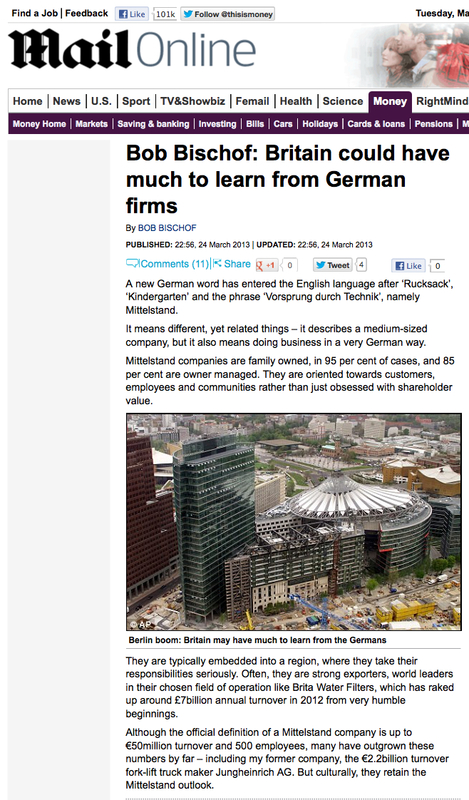 Mittelstand companies are family owned, in 95 per cent of cases, and 85 per cent are owner-managed. They are oriented towards customers, employees and communities rather than just obsessed with shareholder value. They are typically embedded into a region, where they take their responsibilities seriously. Often, they are strong exporters, world leaders in their chosen field of operation like Brita Water Filters, which has raked up around £7billion annual turnover in 2012 from very humble beginnings. Although the official definition of a Mittelstand company is up to €50million turnover and 500 employees, many have outgrown these numbers by far – including my former company, the €2.2billion turnover fork-lift truck maker Jungheinrich AG. But culturally, they retain the Mittelstand outlook. Staying with the narrower definition, Germany has 3.5 million Mittelstand companies, representing 52 per cent of total economic output, 61 per cent of employment and €200billion of exports from Germany. Of these, 1,300 rank as so-called ‘hidden champions’ – world market leaders in their niche, against 67 in the UK and 366 in the US. These companies are regarded as the backbone of German manufacturing, giving it a resilience that has stood the economy in good stead in the economic turmoil. That leads to an inevitable question. Why can’t the UK create a Mittelstand of its own? Britain has brilliant inventors and entrepreneurs, but is not so successful at evolving their ideas into the creation of sustainable businesses, which can grow in to the world-leaders of tomorrow. The likes of Sir James Dyson and the Bamford family of JCB fame are the exception, not the rule. The talent is there, but it seems to be driven too early into the wrong direction. Entrepreneurs cash in, either through a trade sale, to private equity, or by floating on the stock market. It may bring personal rewards, but getting into the short-term profit race can be detrimental to developing new products and markets. I believe that the key difference between our two countries lies largely in the financing of these companies, and the role of banks. Typically, Mittelstand firms finance themselves from retained profits, with bank debt and equity funding playing a smaller role. Germany has around 3,000 independent banks with excellent regional coverage, while the UK has not even a dozen business banks. Although they have many branches, they no longer have bank managers who can make local lending decisions based on a thorough knowledge of customers. The manager of a small or medium-sized regional Sparkasse, Volksbank or Raiffeisenbank in Bavaria or Lower Saxony knows the businesses in his area and probably plays tennis or golf with the owners. Their kids attend the same school. During their last few years at school children make frequent trips to companies in the area and the companies make presentations to get the best candidates for apprenticeships. Universities and colleges also work closely with the companies in their region. Here, we have an opportunity right under our nose. Around 1,000 branches of Lloyds and RBS are up for sale. Rather than selling them to a City conglomerate which no doubt would offer a similar centralised structure, they should be offered in small clusters to regional institutions or individuals with the right background. In co-operation with the Local Enterprise Partnerships they could be part of the ‘business bank’ structure for small and medium firms, which the Government is trying to get off the ground. Lord Heseltine has pointed the way in this direction. The UK could make a start in following this model and building a unique and successful Brit-elstand right now.